The combination of colors provides a playful display for unique contemporary sofa. This sofa set is made from quality cushions and real leather front cover with high quality leather match in the back. 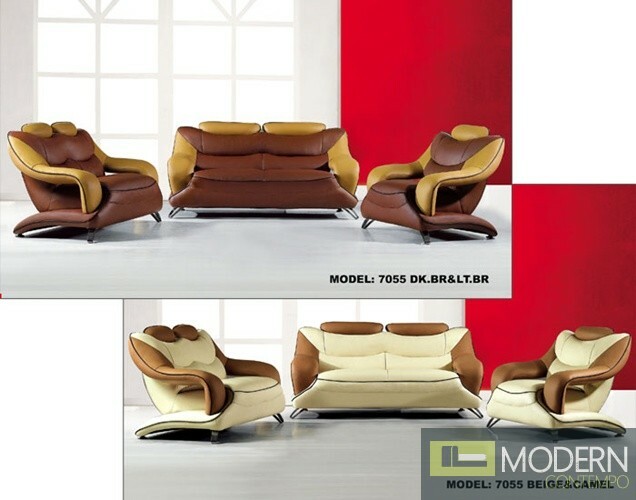 Exceptional features include extra cushion for maximum body and back support, unique sofa design, sleek framework with durable upholstery for long-lasting use. This set includes a sofa, loveseat and chair. Customizable leather covering from selected color palette available by special order. Dimensions: Sofa: H37" x D37" x L80" Loveseat: H37" x D37" x L61" Chair: H37" x D37" x L43"